Every year at SIHH, the Fondation de la Haute Horlogerie creates a special display about time. This display has exhibited everything from historically important artistic watches to fascinating astronomical watches and clocks and even watchmaking courses. This year, the exhibit took on a creative new twist. Called 24 Hours in the Life of a Swiss Cuckoo Clock, the exhibit at SIHH 2016 paid homage to the namesake object of folklore and to precision clocks with roots dating back hundreds of years in Alpine forests. 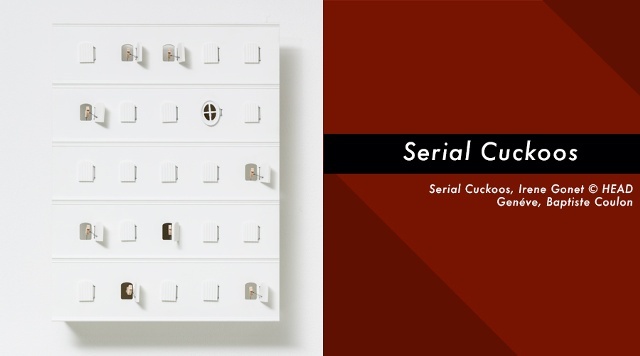 The exhibit showcased twenty-four intriguing cuckoo clocks – all created in response to a challenge by students at HEAD - Geneva(Geneva University of Art and Design). 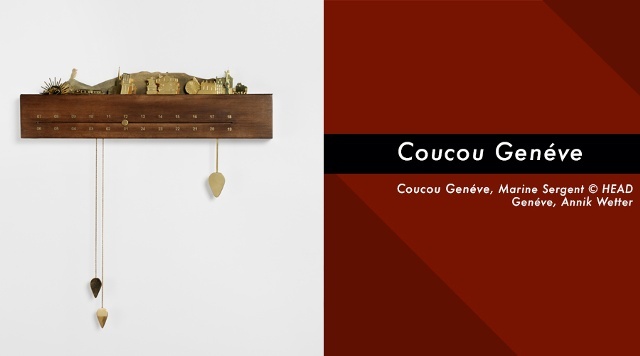 The challenge, put forth by designer Claudio Colucci (at the initiative of Jean-Pierre Greff, Director of HEAD-Genève), was for students to reinvent the charm of the Swiss cuckoo clock and present it in a contemporary mode. Historically, the main point behind the traditional cuckoo clock was to tell a story while marking the passing hours with its regular song. Early cuckoo clocks typically worked via a pendulum regulation and struck the hours with a cuckoo’s call. These early clocks generally had a cuckoo bird that moved in and out of a clock door on the hour. Most were developed in the mid-18th century and today their designs continue to be traditional. Their Swiss Chalet style is essentially a wall clock with the automaton bird appearing through his trap door. 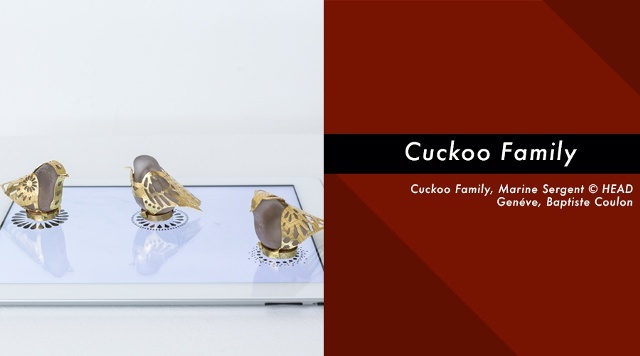 The goal of this project, which involved eighteen fashion, jewelry and accessories design students and six HEAD teachers, was to change the cuckoo. The results were astonishing. Walking through the halls of the exhibit, automatons moved, birds sang and a pervasive spirit of modernity rang true. Some designs were modern spin-offs of the chalet and bird, while others offered a futuristic cuckoo appeal. Many demonstrated a purely artistic motif. A truly modern rendition of a cuckoo click, the Cuckoo Family by Marine Sergent features three cuckoo birds that come to life when placed on an iPad. They generate graphics on the screen. Each of the three birds is associated with a unit of time (hour, minute, second). In the Serial Cuckoos clock by Irene Gonet, the cuckoos have fled the chalets and migrated to the city, where they enjoy apartment dwelling in a Corian building. The hour is read by the number of birds that appear and a golden cuckoo marks the half hour. 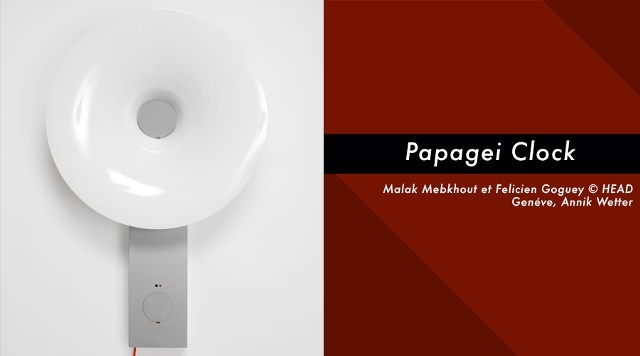 Relying on people for it to come to life, the Papagei Clock by Malak Mebkhout and Felicien Goguey is a system that plays on mimicry. It is a speaking clock that, every twenty minutes, asks passers-by the time. If someone answers, a bird emerges from the center of the clock and his or her reply is repeated and broadcast. In all, the exhibit was a refreshing take on time and tradition. Roberta Naas is founder of atimelyperspective.com.